Family history letter written by William Lake, Sr.
Death:�������� 22 May 1934, Highland Park, IL - Lake Co. In the 1900 census, William and Louisa were living at 329 Barker St. in Clinton, Iowa with their five children, ages 9-16. William is an engineer on the railways and Lousia has given birth to 6 children of which 5 are living. She states that she arrived in America in 1857. In the 1910 census, the family is living on Camanche Ave. in Clinton. William is retired. His son Charles, who is living at home but employed as a machinest. By the time of the 1920 census, William's wife Louisa has died and William has remarried Mabel. Now Mabel is 23 in 1920 and William is 71. Mabel finds that she is pregnant and William accuses her of being unfaithful as no one has ever heard of a man in his 70's fathering a child. William slapped his wife to show his disapproval and ended up spending the night in jail. They must have divorced since I find no further mention of her or her child. The 1930 census, shows William still in Clinton but living as a roomer in the Don Clemmens household. William Lake Jr. worked for most of his life as a railroad engineer.� He went to live with his daughter Louisa in Highland Park, Illinois in his later days and died there. Burial:������� 17 Dec 1966, Fairmont Cemetery, Denver Co.
Death:�������� 8 May 1943, Highland Park, IL - Lake Co.
Death:�������� 22 Mar 1947, Highland Park, IL - Lake Co. I can remember Uncle John bringing flowers and vegetables to our house when we lived in Highland Park. I remember the smells of the flowers. In the Army in France in 1918. Source Citation: Year: 1860; Census Place: Clinton, Clinton, Iowa; Roll: M653_316; Page: 73; Image: 302. Source Citation: Year: 1870; Census Place: Clinton Ward 4, Clinton, Iowa; Roll: M593_384; Page: 155; Image: 312. 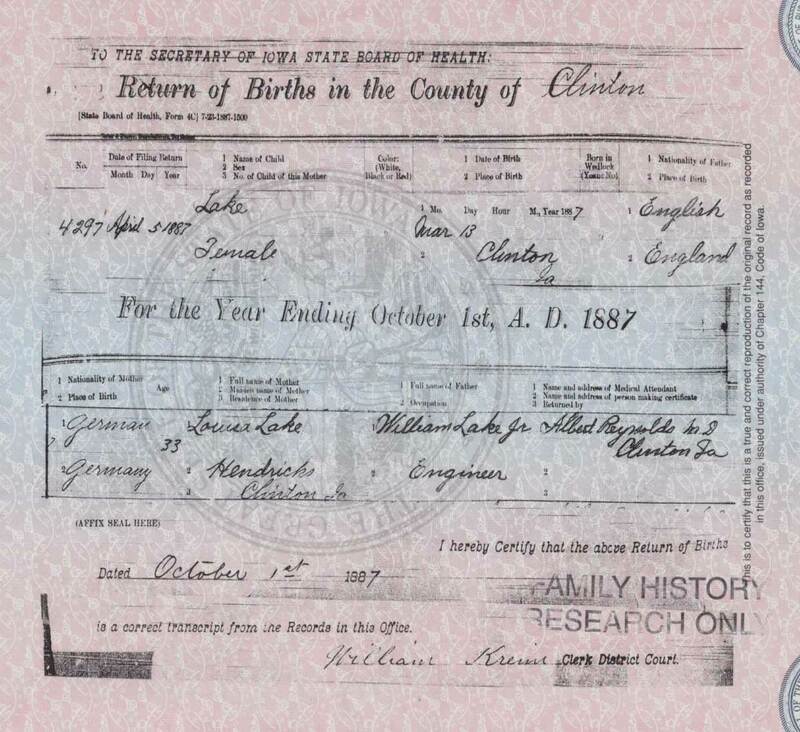 Source Citation: Year: 1880; Census Place: Clinton, Clinton, Iowa; Roll: T9_334; Family History Film: 1254334; Page: 194.2000; Enumeration District: 290; Image: 0390. Ancestry.com. Iowa State Census, 1895 [database on-line]. Provo, UT, USA: The Generations Network, Inc., 2003. Original data: Iowa. 1895 Iowa State Census. Des Moines, Iowa: State Historical Society of Iowa. Source Citation: Year: 1900; Census Place: Clinton, Clinton, Iowa; Roll: T623 426; Page: 16B; Enumeration District: 14. Source Citation: Year: 1910; Census Place: Clinton Ward 4, Clinton, Iowa; Roll: T624_398; Page: 21A; Enumeration District: 13; Image: 845. Source Citation: Year: 1920;Census Place: Clinton Ward 4, Clinton, Iowa; Roll: T625_484; Page: 18A; Enumeration District: 15; Image: 879. Marriage Certificate - Illinois - Cook Co.